Edgar Thoreau Whitehead was born in Venice in 1890. His father was John Whitehead, who with his father Robert had developed the torpedo and together with him was involved in its manufacture. His mother was Princess Agathe of Breunner-Enkevoirth. Edgar’s sister Agathe was to marry and be the first wife of Baron Georg von Trapp, the father of the Trapp Family of Sound of Music fame!! Edgar was educated at Verdin Technical School, Winsford, Witton Grammar School, St. Paul's College, Cheltenham .He obtained a B.Sc in London. Between 1900-1914 he lived abroad in Russia, Poland, Germany, Austria and Belgium. he is listed as a conscientious objector during World War One.He appears to have gravitated to the Workers Socialist Federation of Sylvia Pankhurst during the war years, but then set up his own party the Labour Abstentionist Party in 1919 or 1920. 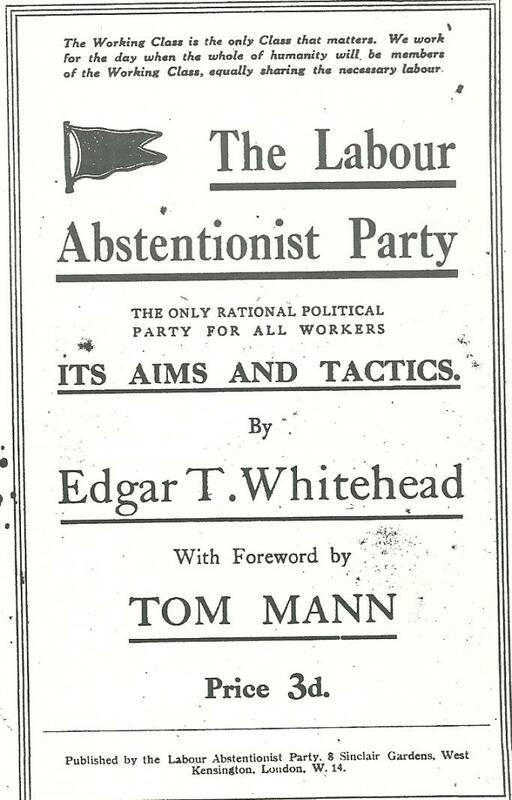 The LAP produced a pamphlet “The Labour Abstentionist Party: the Only Rational Political Party for All Workers: its Aims and Methods”, in London in May, 1920. It is unclear how much support it had, although the pamphlet was prefaced by Tom Mann. The Party’s aim was the “Collective Well-Being of the People” and its tactics were based on those of Guy Aldred, the so-called “Sinn Fein” tactic expressed by the LAP as “securing the election of Parliamentary Candidates pledged to abstain from taking thir seats” and “propagation of the Futility of Parliamentary Action”. At the conference of groups called by the WSF in London on 19-20 June 1920 it was decided to form the Communist Party (British section of the Third International). Besides the WSF, the other components of the CP (BSTI) were the Aberdeen, Croydon and Holt Communist groups, the Stepney Communist League, Gorton Socialist Society, the Manchester Soviet and Whitehead’s Labour Abstentionist Party . The CP (BSTI) stood on anti-parliamentary positions. Whitehead became its secretary at the conference. He wrote to Aldred’s paper The Spur in August 1920 saying that the CP (BSTI) were opposed to anti-parliamentary action, although were not necessarily opposed to taking part in elections, with candidates never taking their seats. Aldred pointed out the inconsistencies of an anti-parliamentary grouping being a British section of an international that propounded Revolutionary Parliamentarism as well as claiming that the CP (BSTI) had been foisted on the movement by delegates with no real mandates from their groups. Subsequently the CP (BSTI) , following Pankhurst’s recommendations to unite with the CPGB, in order to strengthen the anti-parliamentary current within the Third International, according to her reasoning, voted to accept all the statutes of the international. As a result the 4 Manchester branches resigned ( they claimed to have 200 members, a third of the CP(BSTI0’s strength). Whitehead argued that by joining the CPGB and affiliated to the Third International would still mean that the CP(BSTI) members would be still be able to be free to argue against Revolutionary Parliamentarism. There was to be an extraordinary turn around by Whitehead in December. He and others voted at the Cardiff conference of the CP(BSTI) to accept the third international’s 21 conditions, including that on parliamentary action. Whitehead justified this on the grounds of “loyalty to the world revolution”. Whitehead was to go on to serve on the executive committee of the CPGB from 1921. He spent most of 1921-1922 acting for the Comintern in Germany, Scandinavia and America. The black American writer Claude McKay noted that in 1922 he was “liaison agent and interpreter” for the Comintern in Berlin “for English-speaking radicals who were travelling to Russia”. McKay was to recall how they had in the past back in Britain “waxed satirical about Communist orthodoxy and…had often discussed the idea of a neo-radical magazine in which nothing in the universe would be held sacred”. Earlier that year McKay had acted as a character witness for Whitehead when he was detained at Ellis Island in New York after attending the Berlin International Conference of the Foreign Committee for Organizing Workers' Relief for the Starving in Soviet Russia. In september 1922 at the request of the French Communist Party he attended a meeting of representatives of the French, German, Belgian and Dutch parties to discuss concerted action around the current French miners' strike. In 1923 he edited Soviet Russia Pictorial “devoted to spreading information about Russia “ and located at 26 Bedford Row, London WC1. However by the late 1920s Whitehead was to become disillusioned with the Soviets and joined the Labour Party. He became an avid anti-Communist propagandist. He was to write in The Labour Magazine that there was no evidence of democracy within Russian trade unions and none on the shop floor and that the Russian Communist would “only obey the dictates in his trade union work of the local Communist Party Committee” (The Problem of the Russian Trade Unions, August 1928). On 10th September 1951, he changed his name by deed poll to Edgar Bray (London Gazette,14th September, 1951). He is described as an accountant, of 28 Talbot Road, Wembley. He appears to have been using this name from at least 1945. He died in 1956. McKay, C. A long way From Home. The Labour who's who 1924 : a biographical directory to the national and local leaders in the labour and co-operative movement. New information on E.T.Whitehead including that he changed his name to Edgar Bray.